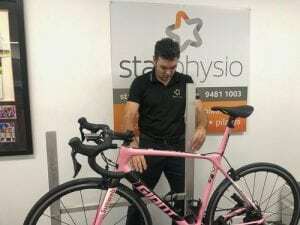 Bikefit by Star Physio with Jack “Cycles Far” Thompson’s TCR. Jack has been a long time client of Star Physio, from Jack’s early days as an Elite Triathlete and Road Cyclist through to his current work as an Adventure Cyclist and Cycling Tour operator. Bikefit is important for every cyclist to maximise performance and efficiency and to improve comfort and reduce or prevent pain and injuries on the bike. When you are a professional endurance cyclist who takes on challenges like the Assos Tokyo to Osaka Cannonball with 602km and 6316m of climbing in 24 hours and next year a race across Australia, the right position is even more important! 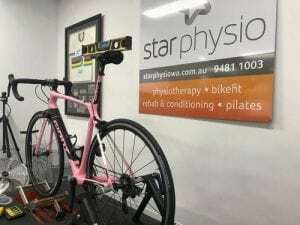 Jack got in touch with Star Physio in April this year complaining of instability at the foot/pedal interface and issues with his bikefit despite trying many modifications and a previous Retul Bikefit. With the amount of miles Jack was doing, and plenty of time to “contemplate” his position and issues, it was slowly driving him (more!) crazy! At Star Physio we have invested in the best bikefit technology in the world from Gebiomized of Germany. Retul were one of the first professional bikefit “systems” on the market with Camera’s at 30 Frames per Second measuring angles between markers placed on the skin or lycra by fitters of various levels of expertise- particularly when it came to anatomical landmarks. Retul were however smart enough to acknowledge that the key to a fit using their system was actually the expertise of the fitter in the process, however this did not stop “less expert” fitters promoting and using the product. Guru-fit, BG Fit, Specialized and a number of other camera based fitting systems were marketed well and used by bike shops, fit studios and physios alike, however all were based around the premise of trying to achieve a particular knee angle, and trying to have the knee/patellofemoral joint be positioned over the pedal spindle at the 3 O’clock pedal position (KOPS). These basic parameters are the same parameters that have been used for over 50 years in bikefit, with the assumption that they were based on science and evidence! KOPS. What we now know is that the science and evidence just does not stack up for KOPS, and previous research that suggested increased risk of knee pain in a forward position was flawed. Knee over pedal spindle (KOPS) may well work for many but it is not important and we can comfortably and safely move people well outside of this position to achieve their ideal fit, depending on many factors including anthropometry or leg length, flexibility, injury history or specific goals in cycling and surface to be ridden on. Knee Angle. We have also learned through good research a number of things about knee angle in cyclists. Firstly, it is very inaccurate to measure outside of a university lab with million dollar equipment. Errors in placement of markers, movement of the skin, movement of lycra and more now make us aware of a likely error of between 10-15 degrees. This is greater than the suggested range of knee angles that a cyclist should use which is generally suggested at between 25-35 degrees depending on what you read and what measurement technique you use. The other big flaw in measuring knee angle is that it is done in 2D, from side on, and therefore does not take in to account the way that the cyclist might move the rest of the body to get that knee angle such as rocking or reaching at the pelvis on the saddle. If you are aware and looking for this compensation you may be able to account for it, but our experience particularly in “re-fitting” clients is that most fitters are unaware of these errors and compensations and leave cyclists in less than ideal positions! The good news is that there is a better way, as Jack “Cycles Far” Thompson found out! Gebiomized technology uses pressure analysis at the saddle and feet to analyse pressure and stability, the cornerstones of an efficient and comfortable cycling position. We combine this with high speed cameras at 60FPS to give us the full picture of how a cyclist works with their bike, and then using our dual skills as physiotherapists and experienced bikefit professionals, take all of this information and test, and re-test, until we find the ideal cycling position for our athlete. A common finding in cyclists previously fitted with camera based tech or by static measurements is that they are too high, and our saddle analysis shows rocking at the pelvis which is both inefficient and often contributes to pain including saddle pain or sores, lower back pain, neck pain, knee pain and more! We found this with Jack and actually made quite significant changes to his saddle position which as you will see in his blog made a huge difference! Add to this our ability to accurately assess pressure and load application at the foot with our Gebiomized system. In Jack’s case we saw that he was trying to produce power with the small muscles at the front of his foot with his cleats too far forward. Poor cleat position also leads to inefficiencies and pain including hotspots and arch pain.